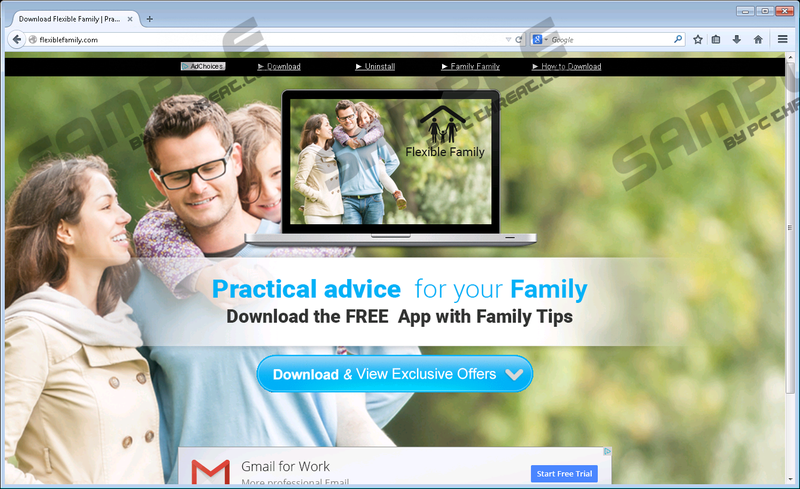 Flexible Family’s developers claim that this program will provide you with practical advice for your family. However, how it does that remains to be seen. We, on the other hand, say that it is an adware-type program that you ought to remove as soon as possible. And, we have evidence to support our claim. We have found that this program was configured to display intrusive advertisements via Internet Explorer and its dedicated advertising window. Also, we believe that some of the advertisements can be of malicious nature and infect your computer with more malware. In this description, we will briefly go over how this program is distributed, how it works, and how you can delete it manually. So let us begin. Flexible Family is yet another adware created by the secretive malware developer that is also responsible for releasing BuiltMoneyMaker, Diet Bright, and BabyMegs. The developer of these programs insists on remaining unknown and does not want any publicity. Well, that is not going to happen because we will provide as much information about it as possible. So because the developer purposefully does not digitally sign its software makes it clear that there is something wrong with it. Even the way this program is distributed is typical for a malicious application. While doing our research, we found that Flexible Family is advertised using browser hijackers (malware that after infecting your computer changes your browser’s homepage and search provider) that include the link to Flexiblefamily.com — this program’s main website that hosts its installer. We have also found that this adware is bundled with the InstallCore installer which means that it comes bundled with other malware by default, so in addition to this adware, this installer can install browser hijackers and potentially unwanted programs, such as MyPcBackup. Therefore, if your PC has been infected with Flexible Family, then, rest assured, you got it accidentally by clicking the download link provided in a browser hijacker’s search results. The link to this adware’s website downloads the InstallCore-based installer named FlexibleFamily_Setup.exe, but it does not initiate automatically. You need to run it for this adware to install. After the installation is complete, it will run in the background and start loading promoted websites. As mentioned in the beginning, it will render its promotions in two ways. Firstly, it will open Internet Explorer and load promoted websites, such as Freebiesfrenzy.com/lp-d4m and Redtag-specials.com/?agent_ID=201735&campaign_ID=6089. Secondly, it will randomly open its dedicated advertising window and load Bestfamilyadvice.com, a shady site that you should not trust. You can close both the adverting window and Internet Explorer at any time, but it will soon come to frustrate you. Furthermore, annoyance is should not be your biggest concern because this program can do a lot worse. We believe that this program’s developers can configure it to advertise malicious websites that could infect your system with very malicious software, such as ransomware, keyloggers, and so on. In short, it would not be pretty, and you might have to seek technical support or an antimalware to remove such infections. So, to be on the safe side, we recommend that you remove Flexible Family immediately. As mentioned, this adware will also create three keys in Windows Registry whose job is to force Internet Explorer to open and load the promoted Bestfamilyadvice.com website. Note that after you uninstall this program two of the three registry keys will remain, and you will have to get rid of them manually if you do not want Internet Explorer to open and interrupt your work. The registry keys are provided below. In conclusion, our research has revealed that Flexible Family is just a plain ad-supported application that is distributed using misleading marketing slogans. In truth, this program will not provide any family advice, but render unrelated advertisements in the form of web pages loaded via Internet Explorer and its advertising window. We think that some of those ads may be replaced by malicious ones and, thus, might infect your PC with dangerous malware. So please follow our instructions to get rid of this program for good. Find the unwanted program and click Uninstall. Open the Charm bar by navigating the mouse to the lower right corner of the screen. Find the adware and right-click on it and click Uninstall. Find the malicious program and click Uninstall. Enter regedit in the resulting dialog box and click OK. Locate the following registry keys, right-click on them and click Delete. Quick & tested solution for Flexible Family removal.